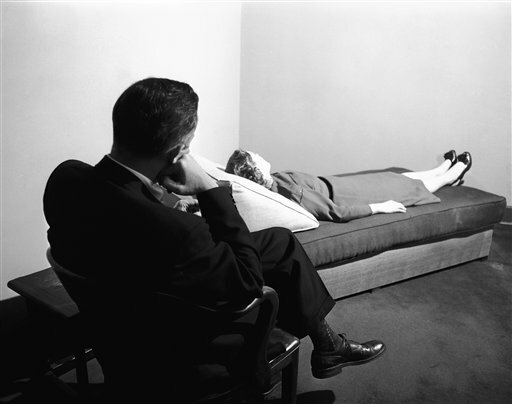 Psychoanalysis is not a science; it is not an art, it is not for all that a religion - although it does mobilize powerful phenomena of belief, Freud is venerated like a Father of the Church, his first patients are celebrated like holy martyrs, his writings treated like the Gospel and the congregations that invoke him practise the excommunication of schismatics just like in the good old days of the Inquisition...I have already mentioned the difference in position of religious and psychoanalytic subjectivity with regard to scientific rationality, the first ostensibly separating itself from it, the second endeavouring to absorb it in various ways. 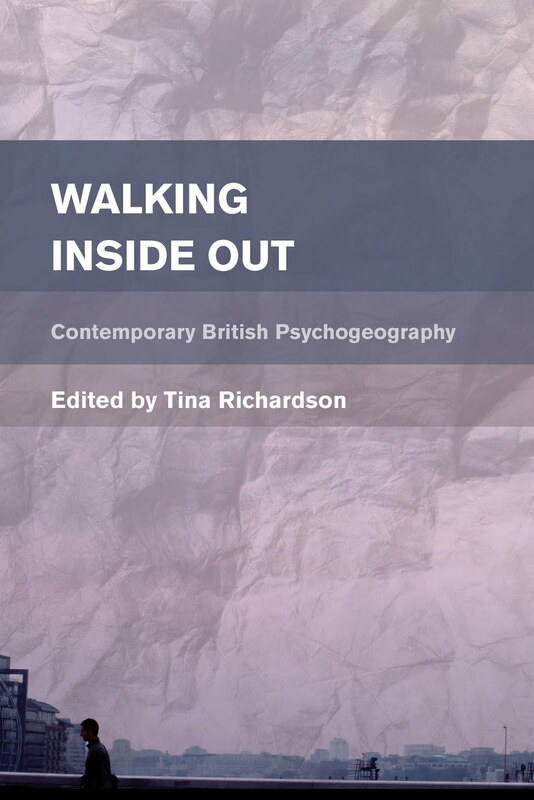 Two other different equally deserve to be noted: 1) psychoanalysis requires a more active participation of its users in its rituals; 2) its myths are more deterritorialized that those of religion. 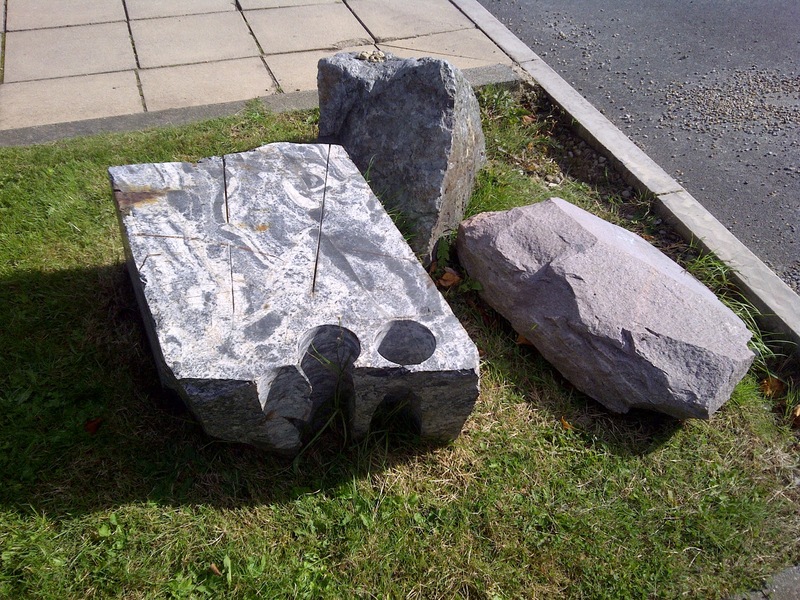 In the summer of 2009 the Henry Moore Institute in Leeds organised an event called The New Monumentality. It comprised of a half day seminar supporting the current exhibition which showed artists responses to campus spaces exploring the architectural modernity of the 1950s and 60s of which they inherited. 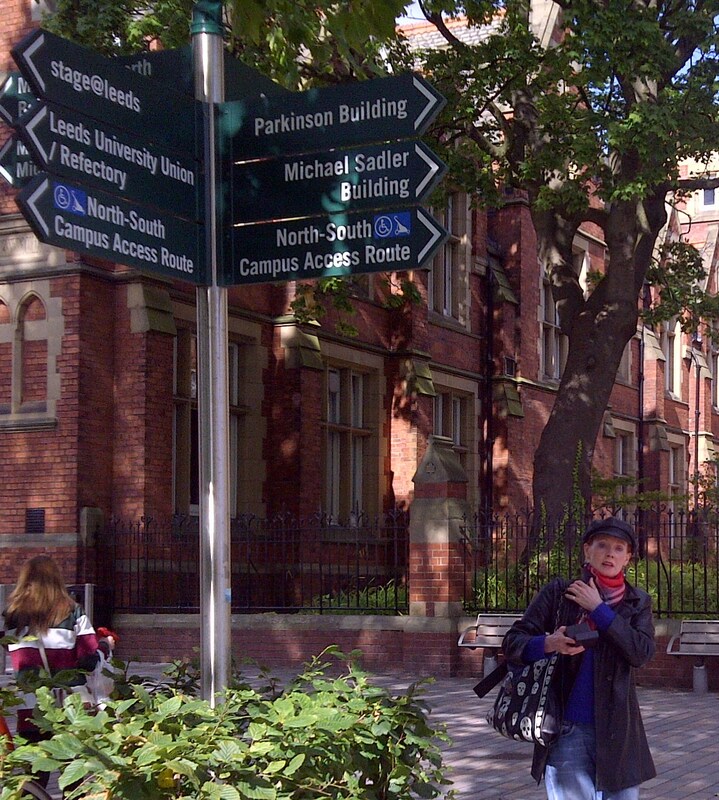 Two out of the three artists included work that had been influenced by the University of Leeds campus. 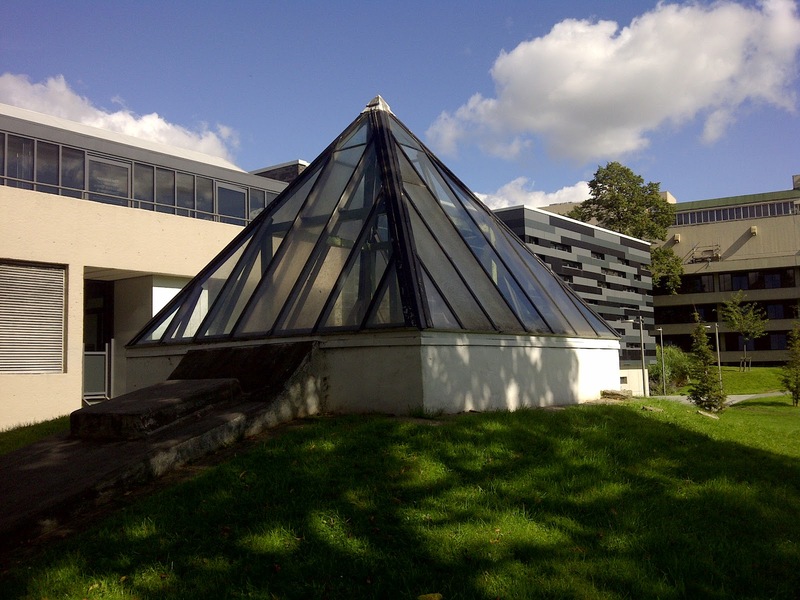 The seminar was called Building the Future and examined modernist campus architecture in the context of cultural theory and architectural aesthetics. A campus walk followed the seminar at the end of the day. During the seminar human the field of capital theory was discussed in regards to education. 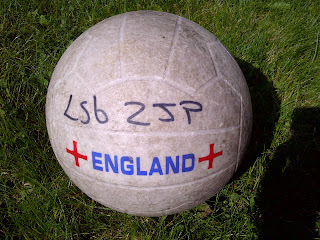 It has been used as an "economic device" since the 1960s as a way of measuring performance. (Fitzsimmons 1999: 1) It became popular at this time due to education being included as a key part of the global economy, and sees "human activity" as " the exchange of commodities and the notion of capital employed is purely a quantitative one." ( Fitzsimmons 1999: 3) This means that individuals sell their education (themselves) on the market, and their degree becomes part of the exchange value for their employment. What this capitalistic approach ignores, amongst other factors, is the value of knowledge as it is for the individual, because it only concentrates on the performative aspect of education, the input/output regimen. 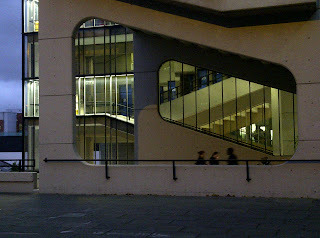 What we see as the corporatised university of today, has its origins in the 1960s where something that could be considered a Fordist or Taylorist approach began to be applied to education, as can be seen in the University of Leeds development plan in terms of moving bodies around the campus, and the economic and efficient use of space (as discussed on previous blogs). 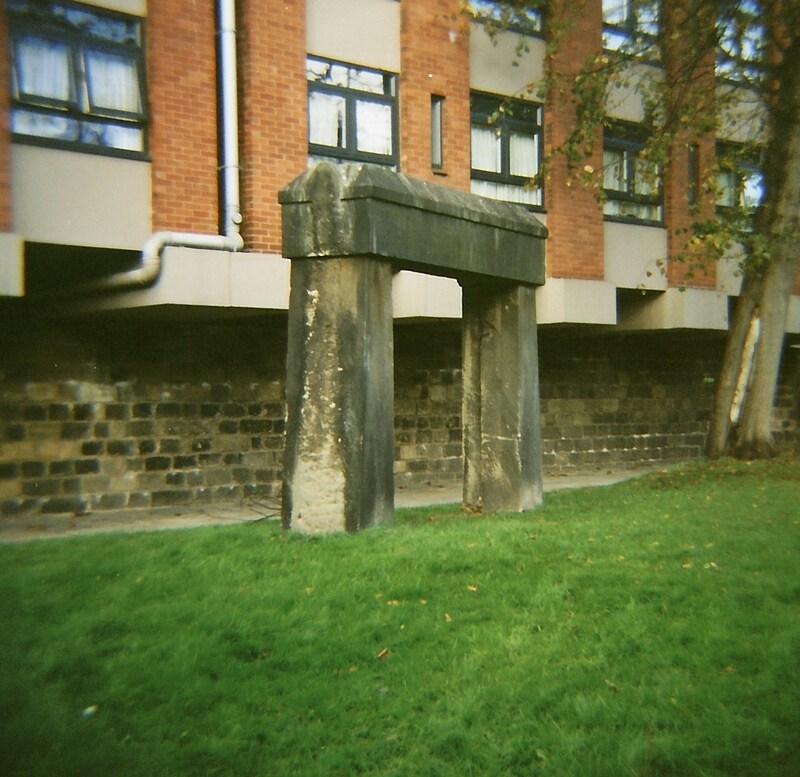 It is the supporting structures in the form of the educational apparatus, the discourse of the university and the abstract and concrete space of higher education that helps form the subjectivity and identities of university students (today, even more than in the 1960s, at a time where course fees are now around £9,000 per year, students see their own degree in terms of an economic investment). 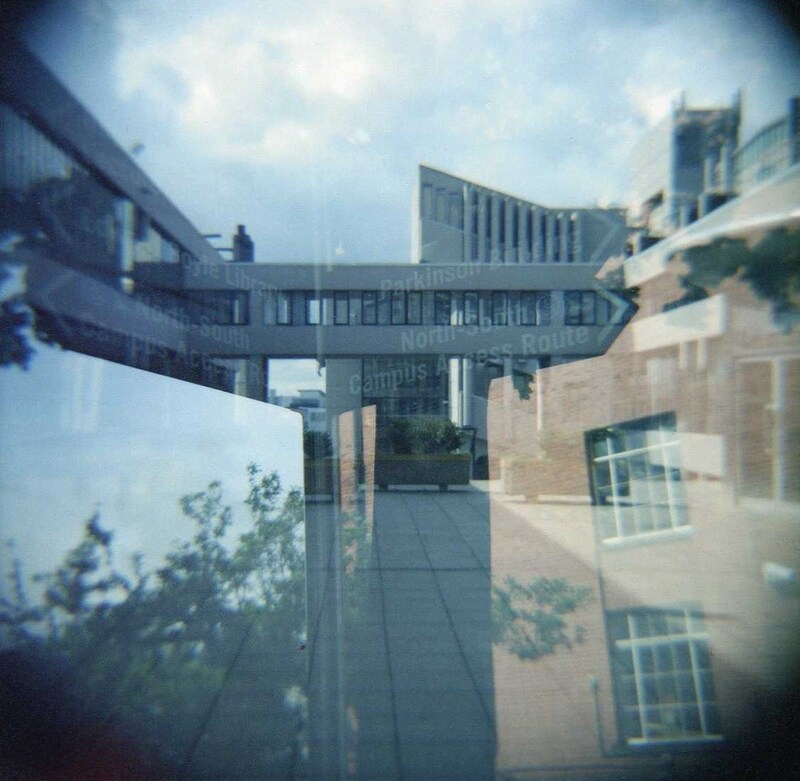 In their article entitled 'Academic Architecture and the Constitution of the New Model Worker' Philp Hancock and André Spicer consider how campus spaces orient the subjectivity of students "towards the production of economically viable modes of identity conducive to the demands of a post-industrial economy." (2011: 91) While their article is a recent one, looking at a contemporary situation at Glasgow Caledonian University - their new library called the Saltire Centre - it nevertheless provides a spatial and ideological analysis which would be relevant in applying to any period of campus architecture. Hanccock, Philip and André Spicer. 'Academic Architecture and the Constitution of the New Model Worker', Culture and Organization, 17, 2 (2011), 91-105. The 1960s campus development by Chamberlin, Powell and Bon (CPB) was the fourth of four main architectural moments for the University of Leeds. These periods had different architects (both in-house and hired ones) attached to them, were situated in different periods and had styles that were distinct from each other, both in design and often in the material used. The university inherited the Yorkshire College redbrick buildings from prior to its 1904 university charter, although still continued to use the terracotta bricks on occasion, as can be seen in the Beaux-Arts style Brotherton Library, completed in 1936. 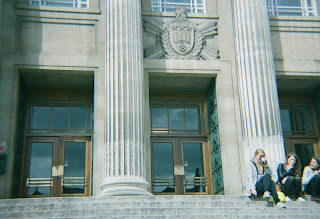 The campus site was redeveloped in the 1920s with Art Deco influenced buildings, often containing neo-classical elements like the Parkinson Building, and mostly made in Portland Stone, although not exclusively. While some of the previously planned buildings were not actually finished until after the war, it is clear from their style they emanate from the 1920s and 1930s, rather than their period of completion, sometimes the 1950s, as is the case with the Parkinson Building. 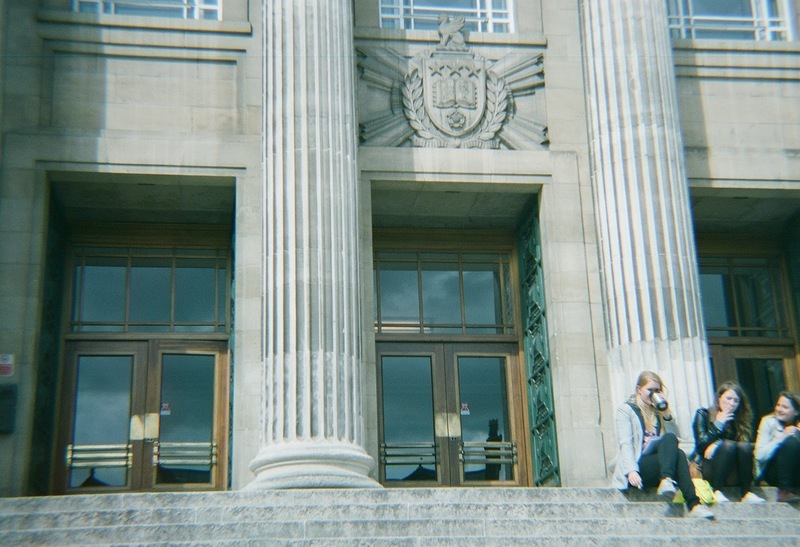 The Parkinson Building is the iconic building associated with the University of Leeds (see image below). It appears as if it is the entrance to the university itself but was actually designed to be the entrance to the Brotherton Library and it is thought that the modern look of it would hide the, then considered, old-fashioned redbrick library behind it. The second Development Plan (1963 - the first was published in 1960) concentrated on the area around what came to be known as Chancellor's Court and its surrounding precinct (see above image). This included departments for maths, science and also administration buildings along with what became the Roger Stevens Lecture Theatre, although the final design of the theatre differs greatly from the one that appeared in the plan). Such was the significance of the hiring of CPB for this project, that the two Development Plans became significant documents in their own right on an international level. And, William Whyte in his article 'The Modernist Moment at the University of Leeds, 1957-1977' (2008), even includes mention of these plans in his abstract, stating "The Development Plan also highlights the way in which architects of the British modern movement used universities as laboratories in which to experiment with ideas about community and proper urban design." 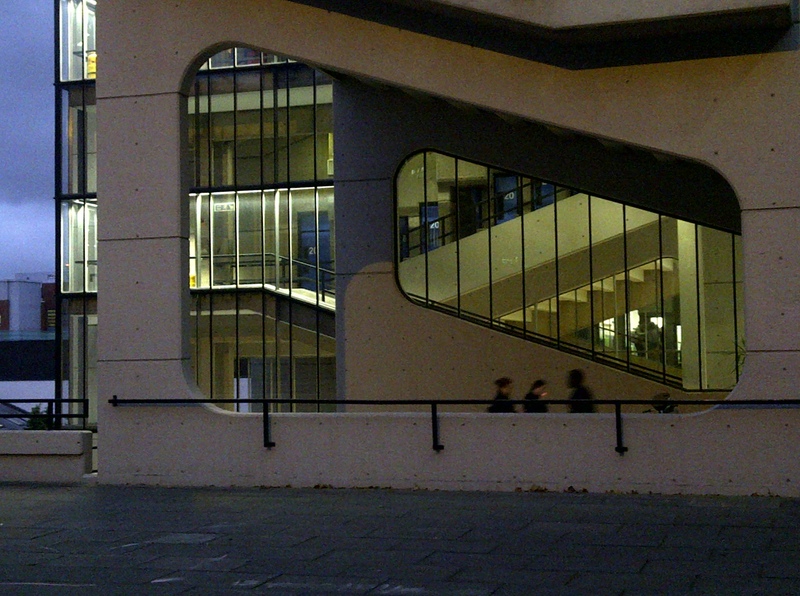 (2008: 169) Having previously completed the famous Golden Lane Estate, along with the nearby Barbican complex in London (which included a school) and also two other schools, CPB themselves were seen as the architects du jour, and these development plans became a kind of 'blueprint' for the modern university. Chamberlin, Peter. 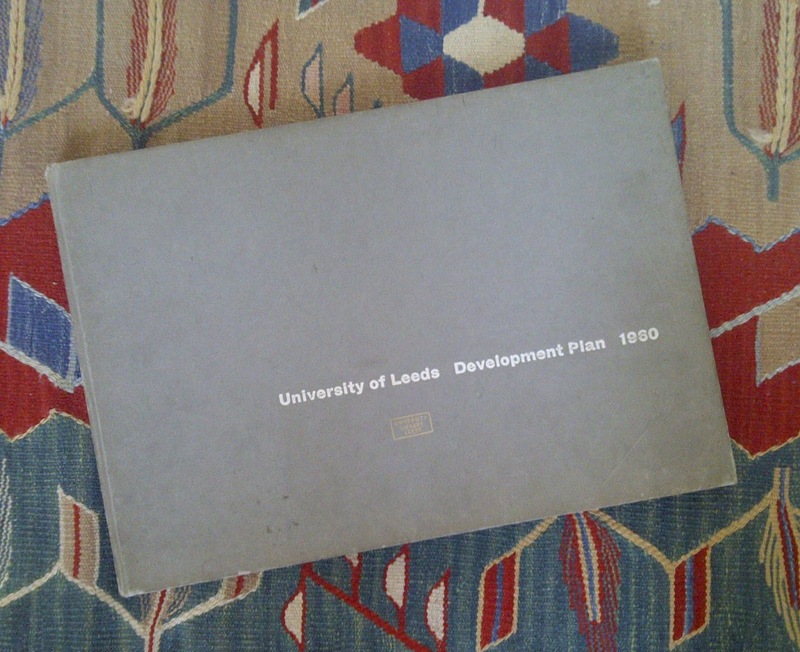 'The Evolution and Realization of the University Development Plan', The University of Leeds Review, 12, 1 (May 1969), 3-17. Whyte, William. 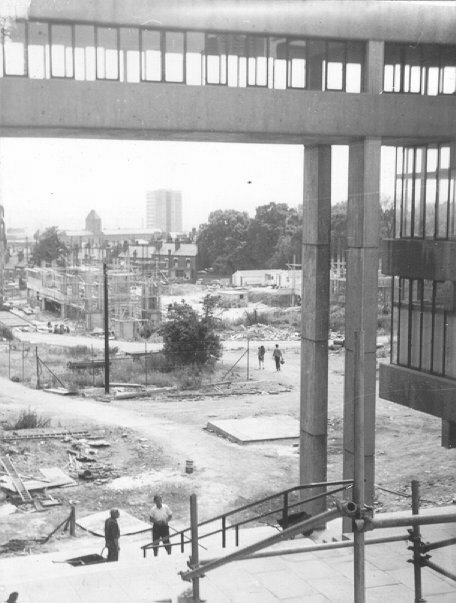 'The Modernist Moment at the University of Leeds, 1957-1977', The Historical Journal, 51, 1 (2008), 169-193. 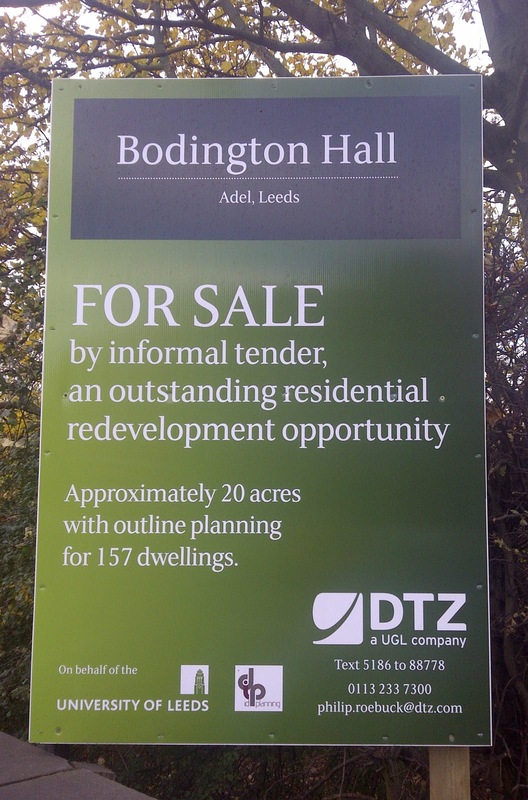 This is the sign at the entrance to the out-of-town University of Leeds halls of residence, Bodington Hall. 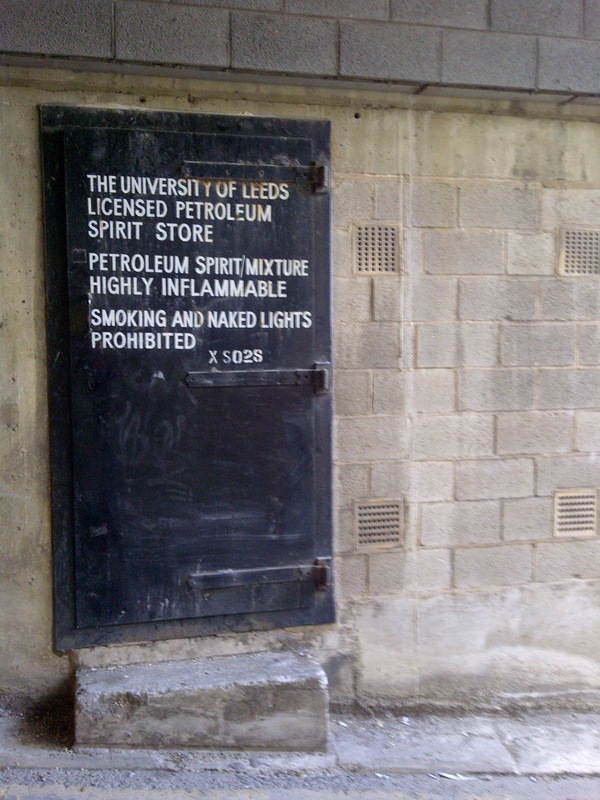 Interestingly, the University of Leeds seem to still be selling it as a conference venue. However, the website says this is the last semester that there will be students here. I went for a dérive there today and it was looking a bit like a ghost town. 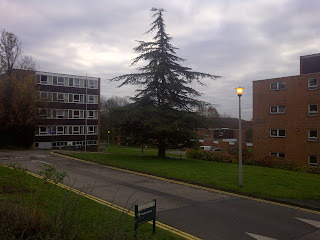 In fact I saw more squirrels than people: only one student, two older people at a bus stop, a cleaner and a lorry driver. 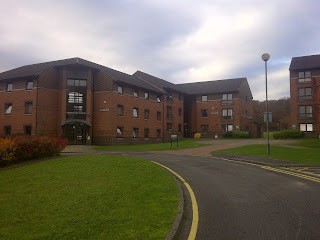 It's a large complex of halls, that up till now had 1140 beds. It has large sports fields, a social centre and its own one-way road system. 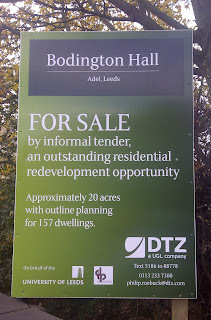 Truly "an outstanding redevelopment opportunity"! 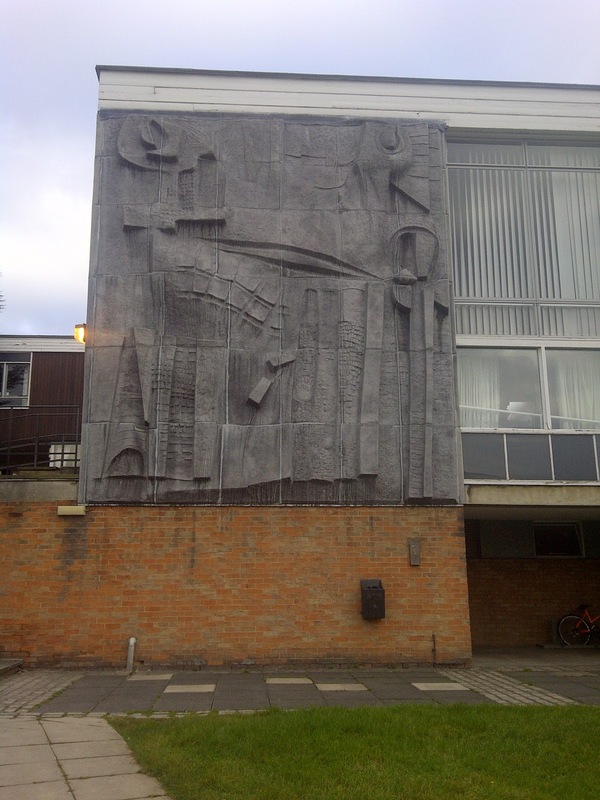 But what is the most significant of its attributes is this fabulous frieze by Hubert Dalwood, who was in the Fine Art Department at the University of Leeds for a while. I'm in the process of finding out its future. 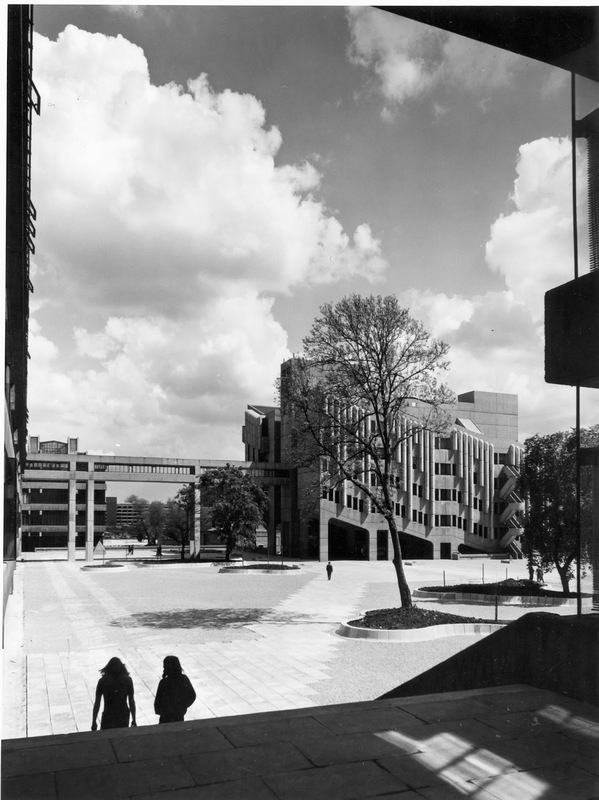 The buildings of the style above were completed in 1963 and photos of them appear in the 1963 Chamberlin, Powell and Bon architectural plan (although the actual architects were Jones and Stocks). 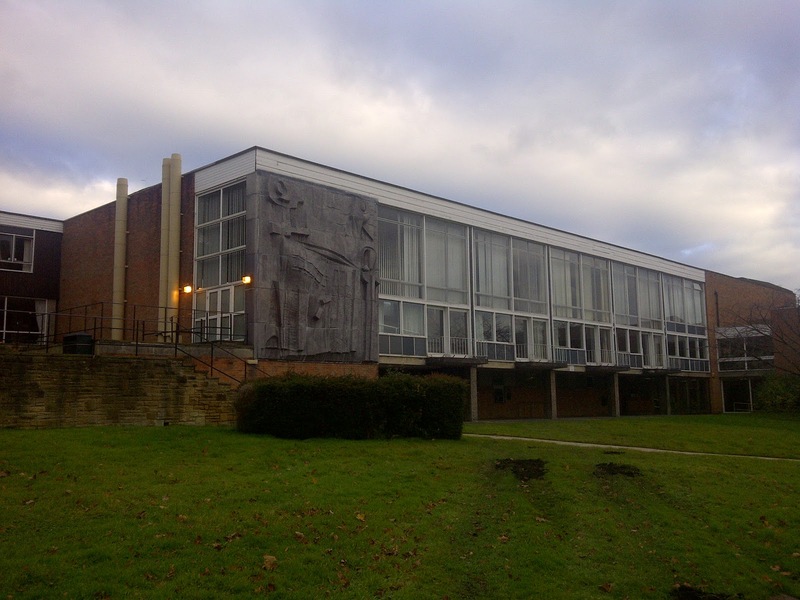 This is what the Times said about the halls in 1961: "a building of considerable grace and dignity". Nevertheless, I guess grace and dignity will be built over by some hideous "toy town" type of contemporary housing (call me cynical). 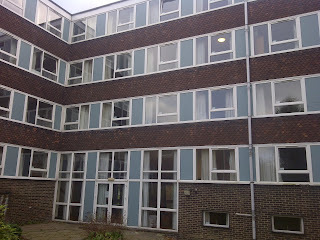 These 1960s buildings (above) look pretty good and have in the large part been well-maintained. These other buildings (see below) look like they may date from the late 70s or early 80s. But I have no further information on them at present. And what about this great chimney, which looks positively Victorian, although I'm sure it's from 1960. 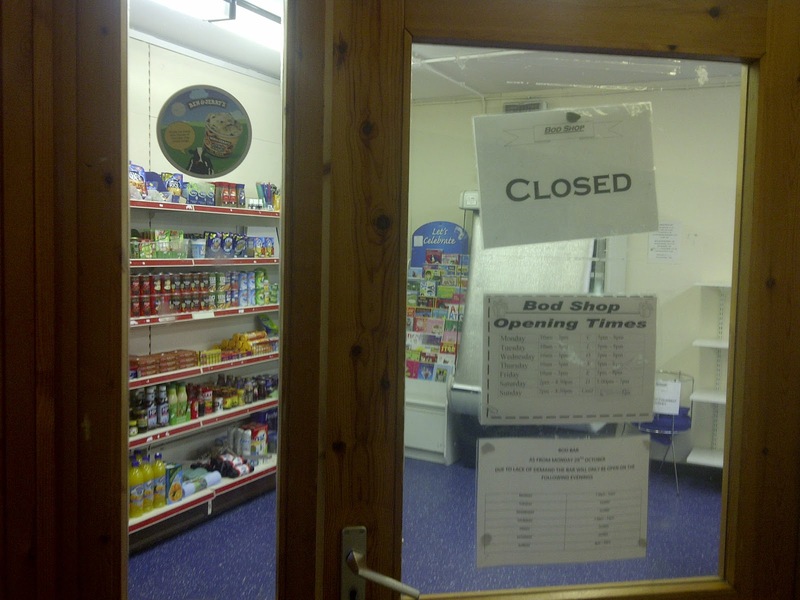 It's attached to something that looks like the engine room, which has a similar look to the 1960s halls. This campus space is in 'the middle of nowhere', as it might be for a student wanting to be in the hub of things (in the rush hour it takes 45mins for students to get to the campus by bus). So, I thought I'd try and find what there was on-site for them in terms of amenities. I was surprised that I could get into the main hall, which I entered in an attempt to find coffee for myself. 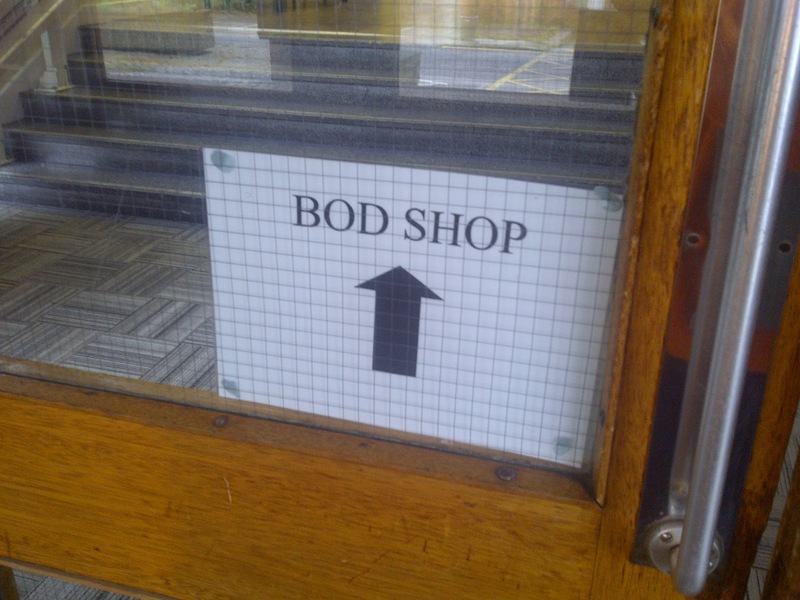 I saw a sign which said 'Bod Shop' but when I found Bod Shop, it was shut. There was also a bar, which was only open on occasions, it said, due to lack of demand. And a billiards hall, which looks like it was still stuck in the sixties. So, what is to become of this space when it is bought by a property developer? Well, I'm sure this fabulous building, which supports the lovely frieze, won't be kept. Look at those great windows and the elevated floor. The boom in campus expansion from 1960 to 1970 was the largest ever undertaken in Britain, with students increasing from 100,000 to 200,000 by the end of the 1970s and the number of universities almost doubling, with 46 reached in total by the end of the decade. 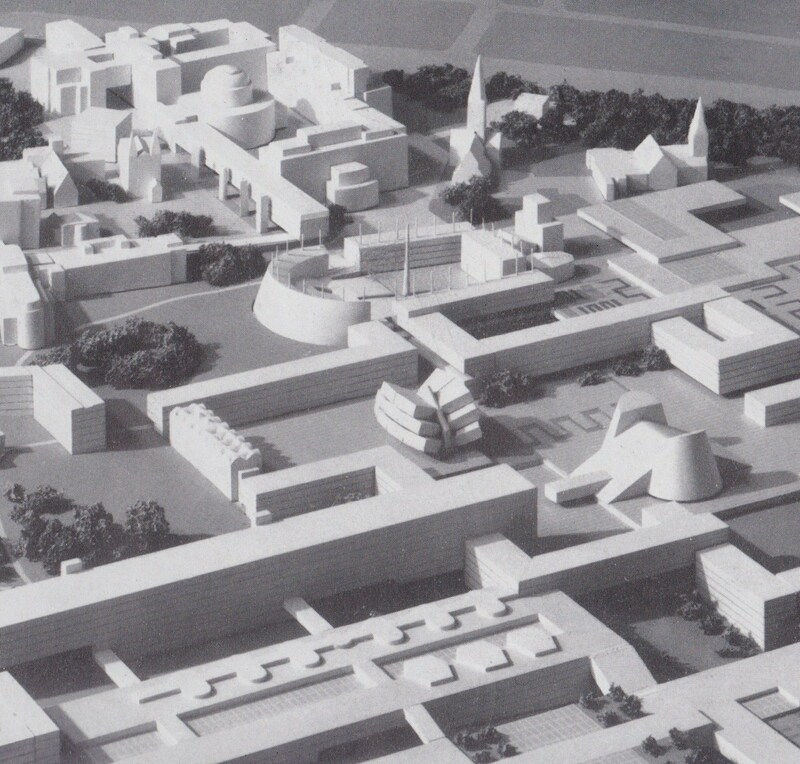 (Birks 1972: 9) This was a monumental task for in-house university architects, bursars and estate administrators alike. 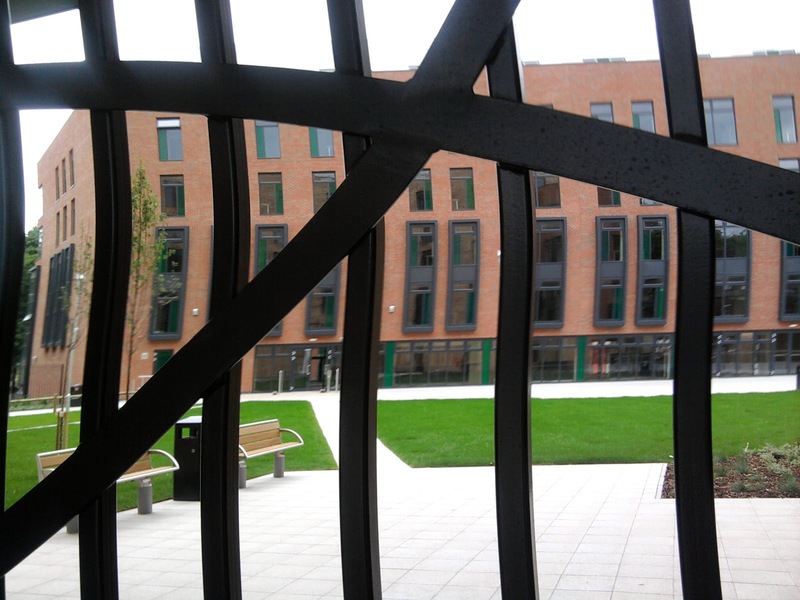 Thus the undertaking of Chamberlin, Powell and Bon as Master Planners at the University of Leeds, rather than architects per se, enabled an outside influence to oversee the plan and provide time and skill in an attempt to both work within the existing campus space, and provide solutions to the potential problems attached to the expansion of that space. The final paragraph of the plan stresses the town and gown aspect of the university and how it should be more connected to the town, and finishes by saying "For it is no exaggeration to say that the confidence of a civilisation in itself may be judged by the value of its investment of energy and wealth in the widening of educational opportunities for the coming generations." (ibid.) 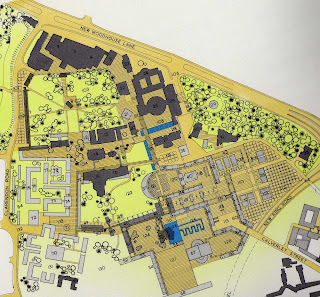 It would be another two years before the next plan appeared, although work had begun on stage one of the actual campus development in that interim period. Birks, Tony. 1972. 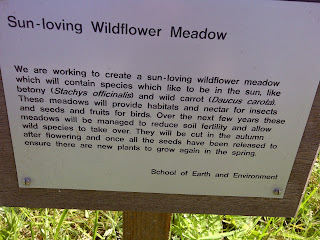 Building the New Universities (Newton Abbot: David and Charles). Chamberlin, Powell and Bon. 1960. 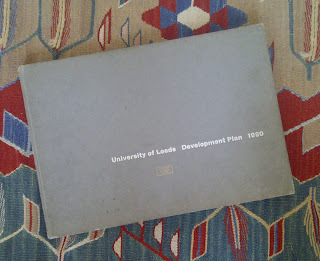 University of Leeds Development Plan (Leeds: The University of Leeds). In recent years the University filled the whole space with such a quantity of street furniture, foliage and inelegant public art that you can almost ignore the building. 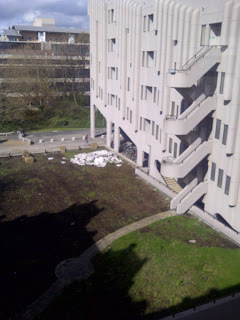 meanwhile the concrete - sculptural, shuttered stuff similar to that used in Chamberlin, Powell and Bon's hugely successful Barbican complex in London - was painted in estate-agent magnolia, and the halls of residence are being demolished, it being easier to house students in the barracks provided by the likes of Unite. What is interesting here is that the recently completed halls replacing the one mentioned above still carries the same name. 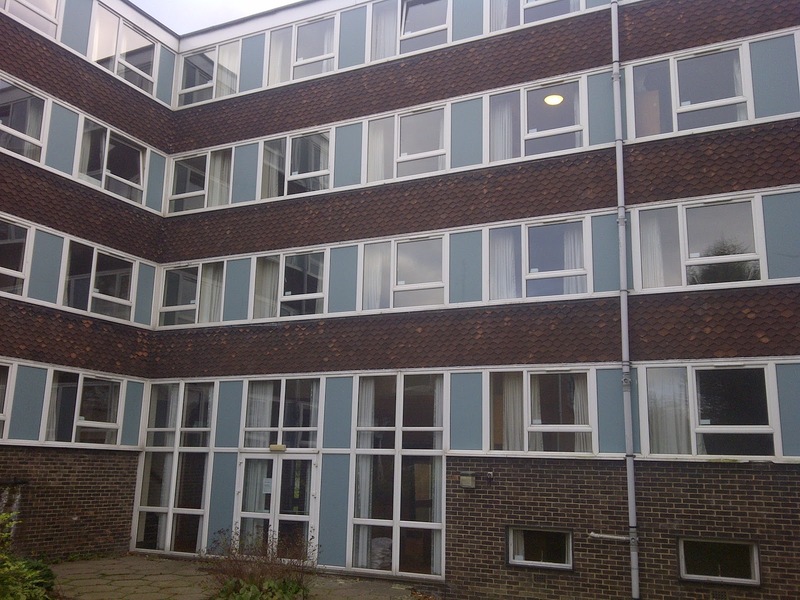 The 'new' Charles Morris Hall halls of residence opened in 2010, replacing the original ones dating back to 1963. The original halls was made up of three separate houses: Whetton, Dobree and Mary Ogilvie House. 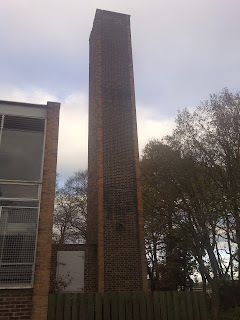 In 2007 the old Charles Morris Hall was not considered fit for purpose and proposals for its demolition were drawn up. The demise and semi-resurrection of these halls could be seen as both an attempt to move beyond the modernist ideas of a past university, by creating a new halls that is better suited to student living. But, also, by keeping the name the same, we could consider this to be a return of the repressed in the sense that the university has been unable to totally move on to the new project that is required of it: the past repressed self continues its attempt to be acknowledged and seeks avenues that enable it to be gratified in the present. The Charles Morris Hall cannot shake off its 1960s self, and therefore reappears as a postmodern 'noughties' version of itself. That the University doesn't know what to do with the campus is obvious enough. In early photos, you can see the central space occupied by the sculpted nature of a planned garden, akin to the designs of the Brazilian landscape artist Roberto Burle Marx. 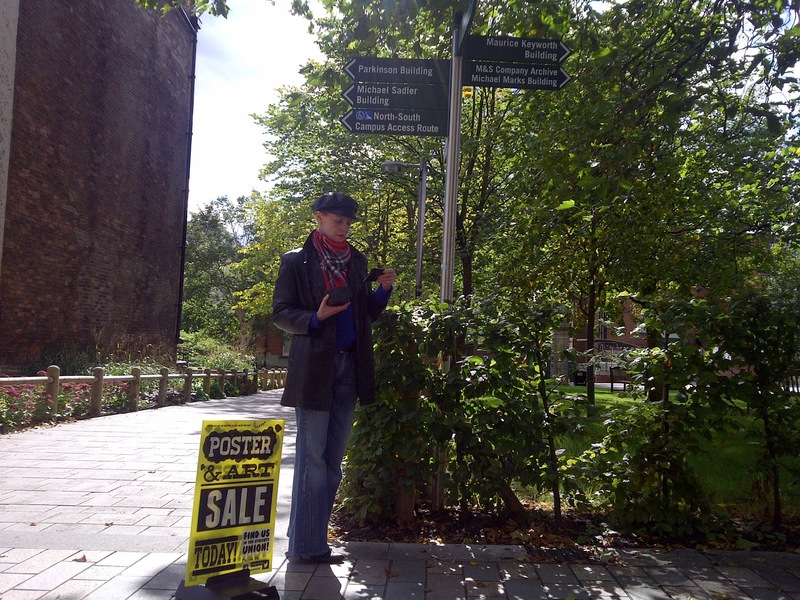 In recent years the University filled the whole space with such a quantity of street furniture, foliage and inelegant public art that you can almost ignore the building. meanwhile the concrete - sculptural, shuttered stuff similar to that used in Chamberlin, Powell and Bon's hugely successful Barbican complex in London - was painted in estate-agent magnolia, and the halls of residence are being demolished, it being easier to house students in the barracks provided by the likes of Unite. 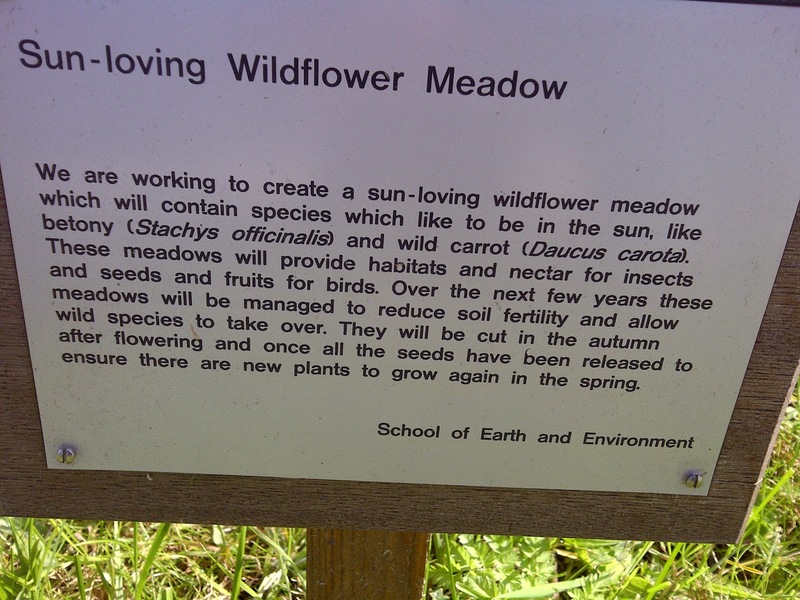 The old campus is a place that cannot make sense in the present, yet this might be what is most valuable about it. There is so much to comment on in this paragraph, but here I shall only be discussing Hatherley's remark on the campus not knowing it's purpose and will comment on the halls of residences being demolished in part 3. Firstly, "That the University doesn't know what to do with the campus is obvious enough". It's not apparent what Hatherley actually means by this. Does he mean in regards to it's overall design? It's aesthetic style? 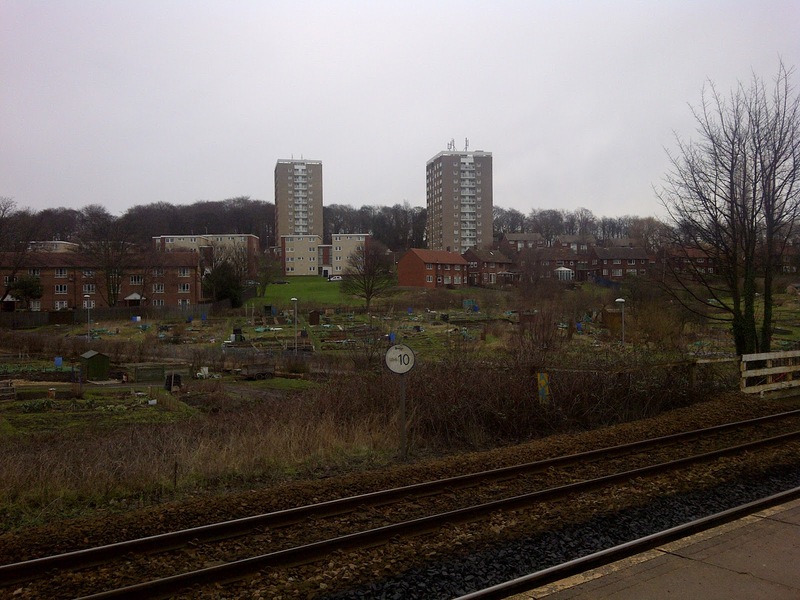 Or just the general practicalities of placing much needed new buildings into the gradually diminishing space? When taken in the context of the last sentence - The old campus is a place that cannot make sense in the present - perhaps we can assume this is an issue of identity. This is an interesting point because I think if he were taking about a city in postmodernity, he wouldn’t make the same remarks. A city, say, like London that contains many differing periods of architecture, buffered up against each other, and shoe-horned into small spaces - a typical postmodern city. 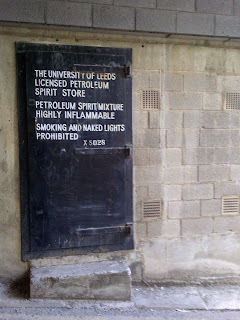 However, if we compare The University of Leeds to some of the American campuses, say UCLA, I think it makes more sense. UCLA has a very distinct aesthetic which means it is presented to the occupant of that space, the spectator if you will, as a homogeneous place. Much of the UCLA campus is built with this pale apricot brick. It makes buildings from different periods look more similar and gives the illusion they were not built years apart. 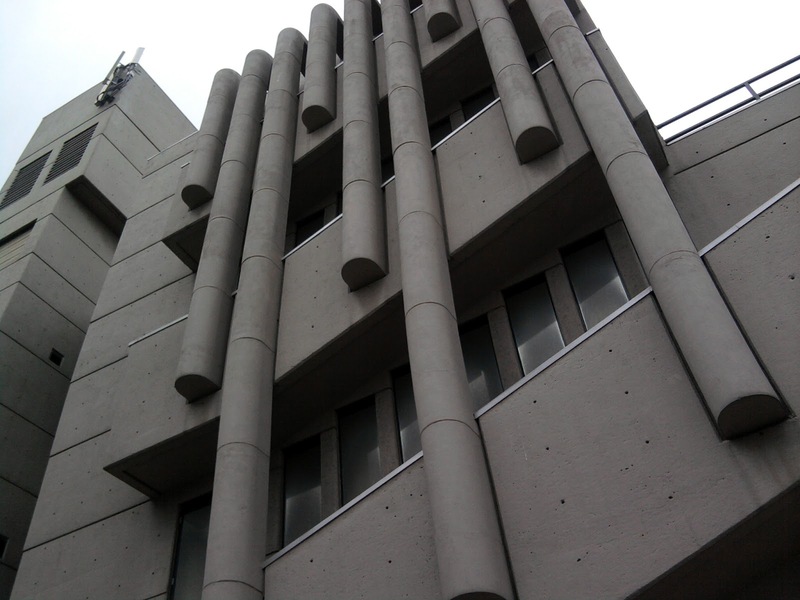 While there are some different looking buildings on the UCLA campus, in different architectural styles, the main section looks like the building above. I would describe UCLA as a pristine-looking campus. 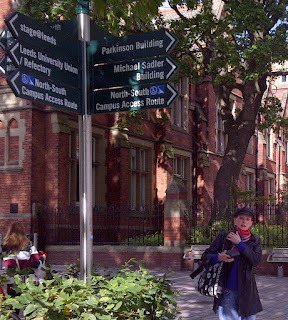 However, it doesn't have the richness and diversity that the University of Leeds campus has on an aesthetic level: while the UCLA campus is much more 'lovely' it is not nearly as 'interesting' as Leeds. 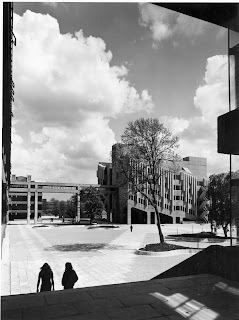 "Leeds University in particular can boast one of the most impressive attempts to design an inner-city campus as a total, coherent environment, albeit without the need for CCTV and gating - the complex of university buildings designed by Chamberlin, Powell and Bon between 1958 and 1968." "Local rumour has it that this complex served as a set for the seventies science fiction series Blake's 7. This should come as no surprise. There is a divide in the perception of these buildings between the future they seem to suggest - a space-age society with egalitarian buildings make no reference to anything so prosaic as local materials, human scale or history, which some of us may find liberating, other unnerving - and the past they are most often seen to represent. That is, the other 1960s, not the now very familiar decade reminisced over by ageing soixante-huitards but the decade of a new landscape of towers and slabs, walkways and motorways, which is only very slowly starting to come back into favour after decades in which it was abhorred by many as an example of top-down quasi-totalitarianism, often better known for its transformation into film-set dystopias at the hand of Kubrick, Truffaut and Antonioni." Chamberlin, Powell and Bon produced two bound plans for the university in the early 1960s (see above image). 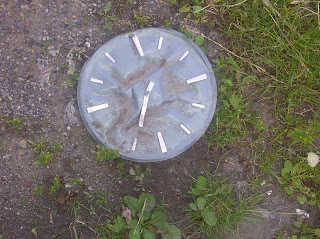 I don't think it would be a stretch to describe them now as objet d'art in their own right. These publications were distributed to university staff at the time. They aren't that easy to get hold of today. I have seen them for sale for as much as £100 online. 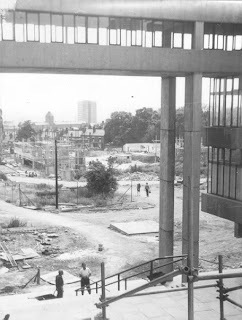 Chamberlin, Powell and Bon's vision was futuristic, as suggested by Hatherley, but it was also a contemporary response to the need for an expanded campus that could accommodate all the new postwar students. While it included the idea of students communing in Italian inspired piazzas, it also took a very rational and economic approach to the use of space. This even appeared in the form of 'joker' floors on the top of teaching buildings, which could easily be converted to teaching, administration or residential floors. Until recently some of these floors were still residential halls, as was the case in the Social Sciences building. 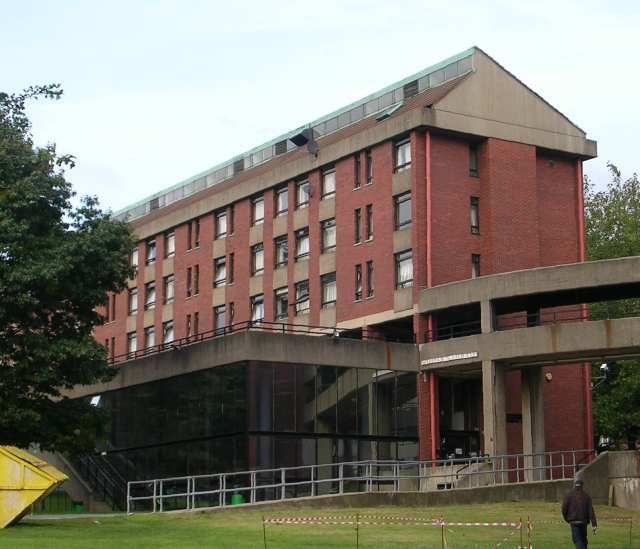 Whether you like, dislike or are indifferent to Brutalist architecture, much of it is now being listed, as are a number of these buildings at the University of Leeds, including the Roger Stevens Lecture Theatre shown in my first photo. So, its legacy is still really a work-in-progess. 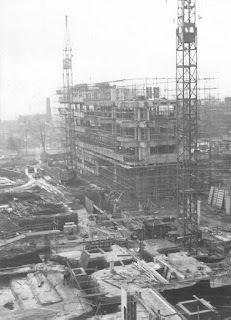 Elain Harwood, in her recent book on Chamberlin, Powell and Bon, when commenting on these university buildings says: "They have proved to be as adaptable as Chamberlin had promised, with the walls moved ad infinitum and service ducts coping with increased loadings. [...] The teaching buildings were listed in 2009, to ensure the conservation of their special qualities." This is part 2 of the blog which is an account of a dérive I did with Tim Waters on Saturday 22nd of September. Please click here for Part 1. 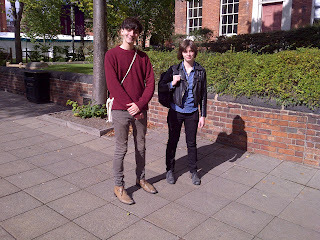 At one point on our walk the Dérive App told us to stand still for 3 minutes. 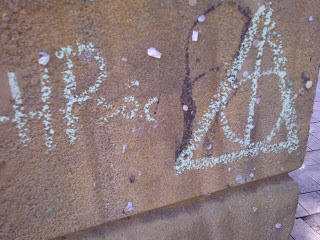 Tim spotted some chalk graffiti on the wall and we checked it out. 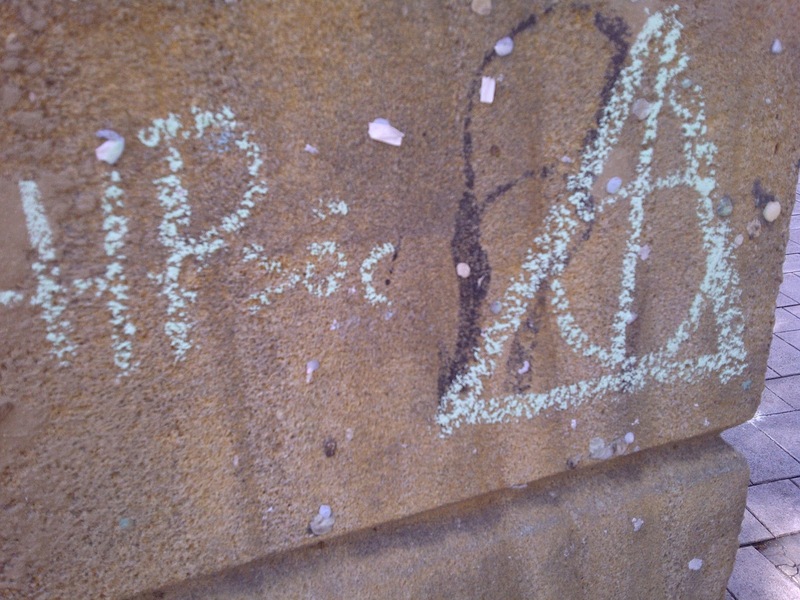 It appears to be a symbol from Harry Potter (hence the HP) and we thought it might be for the Harry Potter Society on campus. 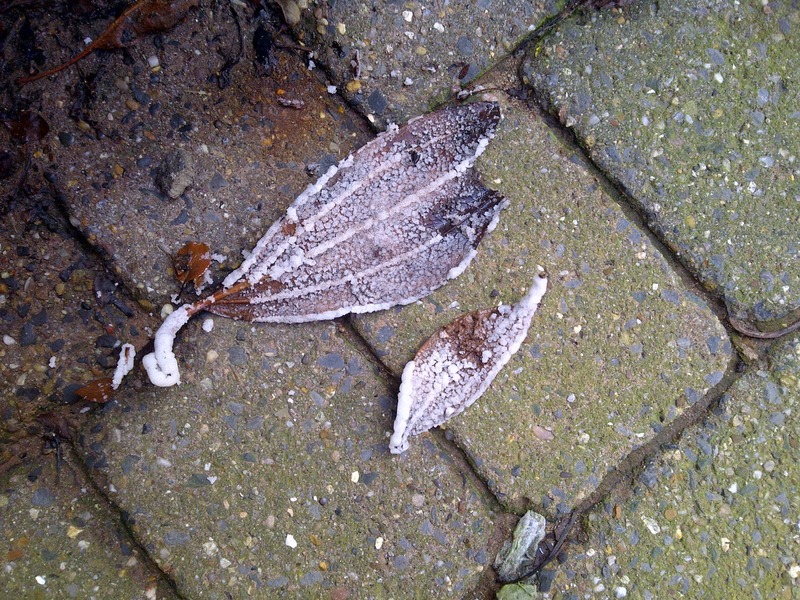 While the leaves below look like they are covered in frost, they are actually from the grit bunkers on campus. The bunkers seemed to have two types of salt in: the orangey stuff that us used on urban roads, but also white salt. 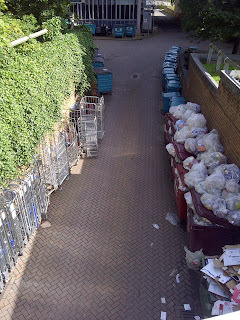 The university is really well organised in terms of its recycling. 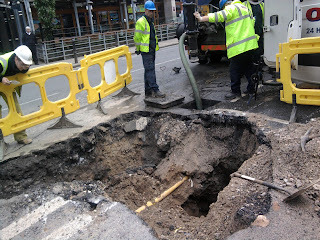 This seems to be the area where it is stored. 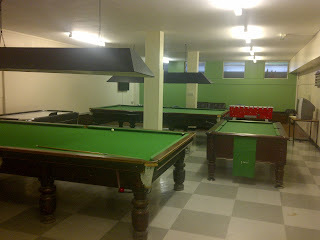 It is located under the little bridge that takes you to stage@leeds. 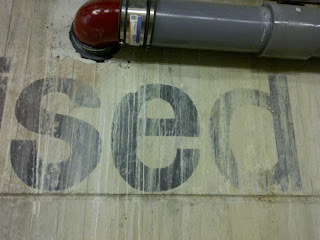 This is the final image of the blog. This football was found in Chancellors Court. I looked up the postcode and it is the Woodhouse area of Leeds. 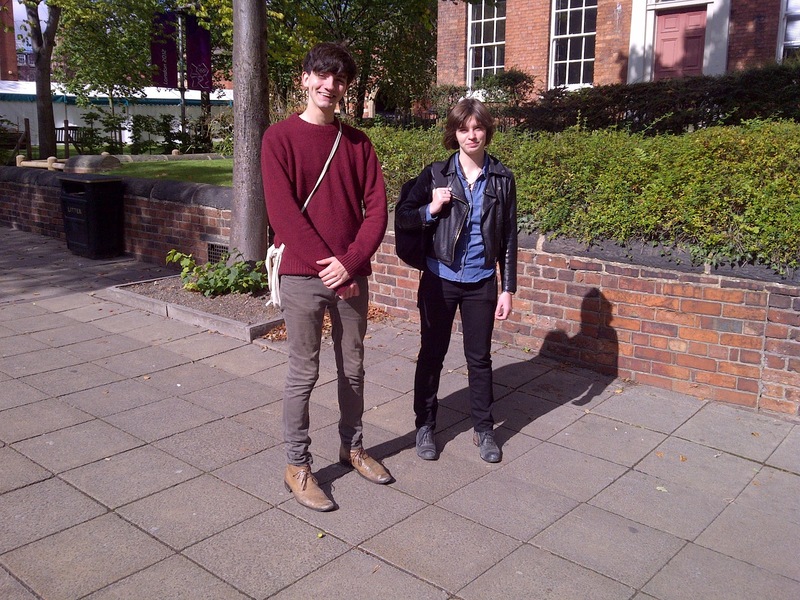 On Saturday 22nd of September Tim Waters and myself went on a University of Leeds campus dérive. We decided to use two different methodologies to create the chance route: an urban app (well, more a website) called, unsurprisingly, Dérive App, and also Oblique Strategies, a system used to help the flow of creativity. We used the two in conjunction with each other, for example, when one or the other didn't quite work, or to help us make a particular decision in regards to our route. It was a nice sunny day, so the campus looked lovely. 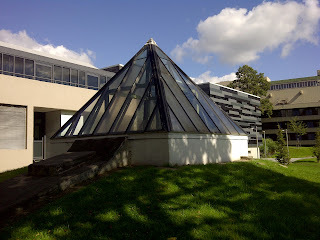 Here is one of the campus' three pyramids. 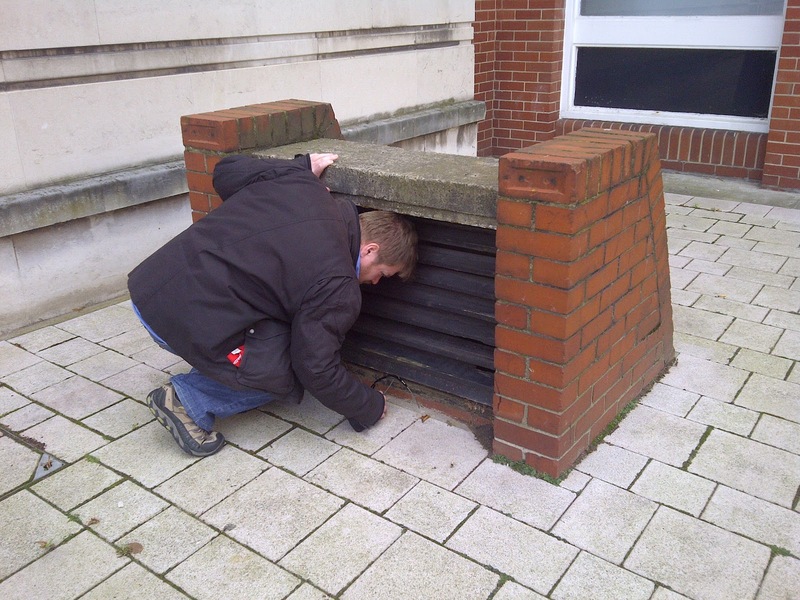 This one is located at the back of the Student Union and if you climb up you can look down into a chamber, which is a room that I believe is no longer used. These interesting pieces of rock have striation and bore holes on them, maybe made by geologist exploring the campus, or even discarded by the very same. Anyway, they now sit on the ground between the E C Stoner building and the Sports Hall. 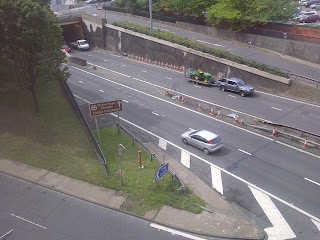 We wandered around in the underpasses below the precinct area. 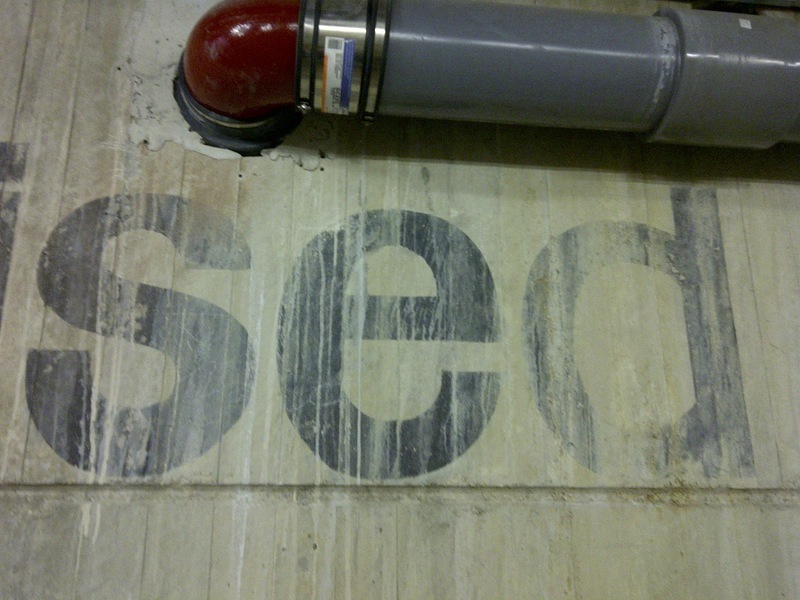 It is part of the underground infrastructure of the campus, built in the 1960s. 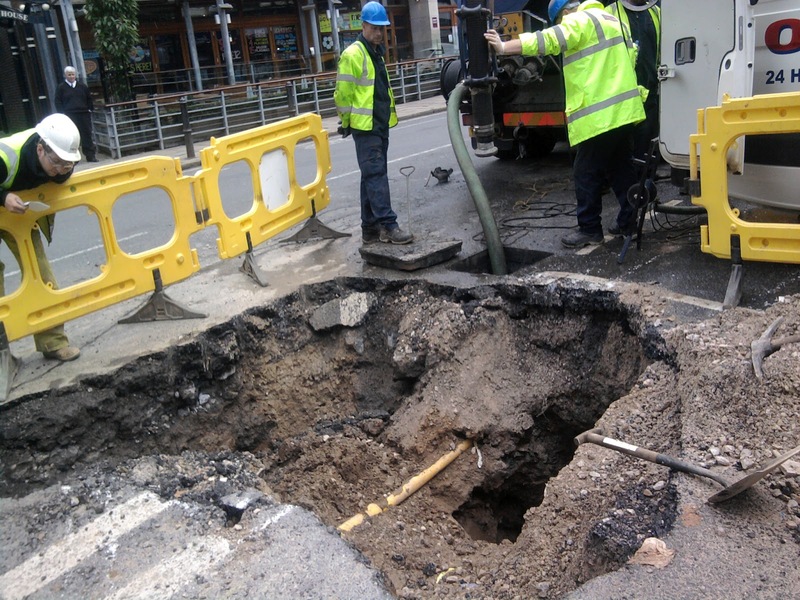 There was quite a lot of maintenance-related phenomena including much pipeage and quite a lot of dripping water that had formed stalactites and stalagmites in places. 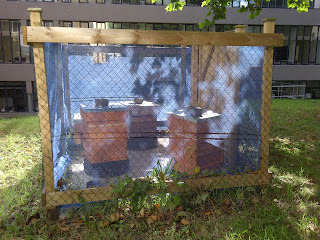 Tim spotted a lovely beehive, semi-hidden between buildings, which we were surprised to see wasn't cordoned off in any overly security-conscious way. 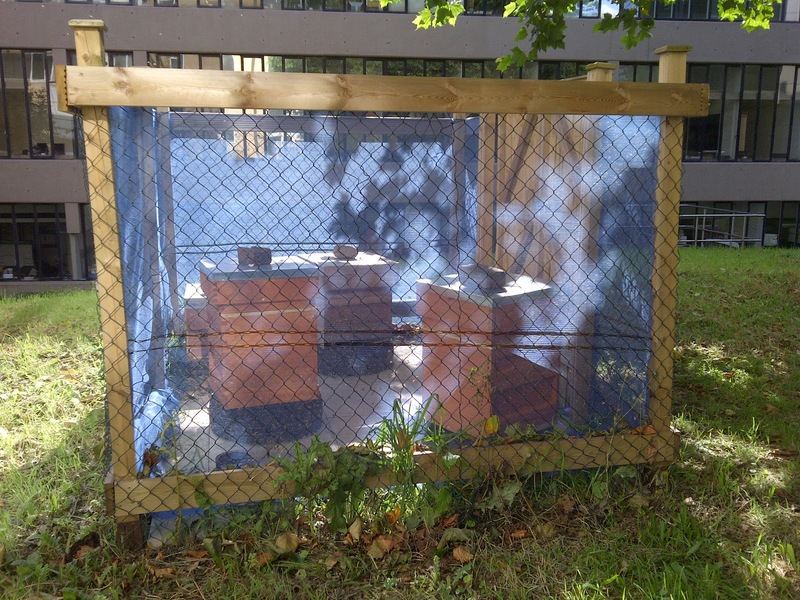 But, then, maybe the bees themselves were a good enough deterrent. The 'couple' below allowed us to take a photo of them. The dérive app told us to look for a couple by showing us a picture of two individuals holding hands. We spotted this chap with his arms around his 'partner'. We thought they were a couple, so I asked them if we could take a photo and explained why, but they were actually brother and sister! This is NOT my Summer! 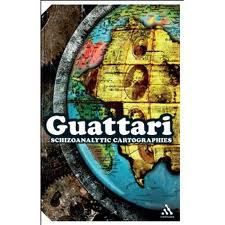 Yesterday (Saturday September 15) I went to an excellent cartography workshop at the university campus called Campfire on Wild Cat Island: Workshop about literary maps, fictional geography and...holiday memories. My own map, above, is a ribbon map. These types of map are new to me, but I like their linear form. 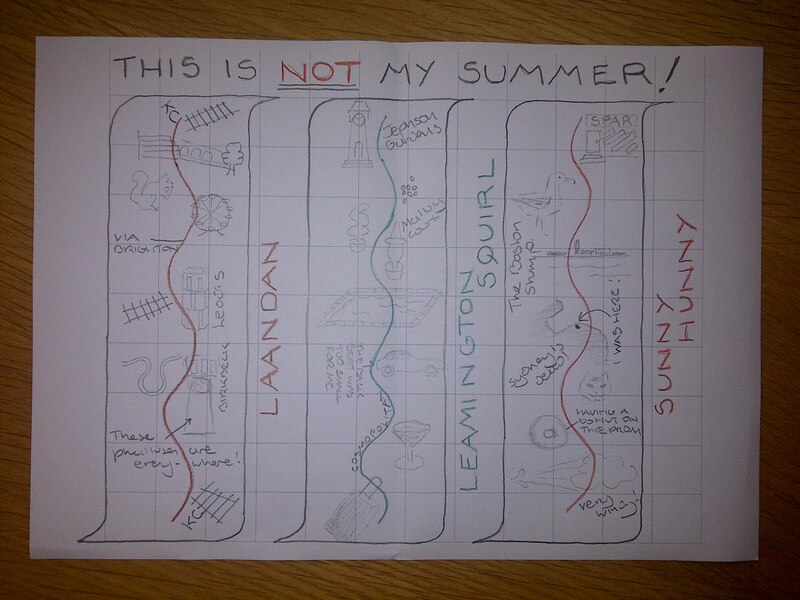 I decided to create one on the three places I visited this summer: London, Leamington Spa and Hunstanton. They highlight the urban phenomenon I came across on my travels - anything from a Porsche to a boarded up Spar shop. They also contain a few animals: a squirrel, a cat and a Herring Gull. Some topiary. The London Eye and the Boston Stump. My map also contains two tiny maps. If you can spot them, let me know what places they represent and I'll tell you if they are correct! 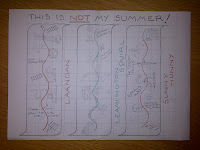 I decided to name it This is NOT my Summer! because obviously it isn't - it's a map! In part 1 of the blog I discussed Michel De Certeau's definition of the terms 'space' and 'place' from The Practice of Everyday Life, one of the main differences between the two being that place prohibits the superimposition of particular phenomenon, while space is able to cope with the contradictions of multiple and differing actors/actions, systems, agendas, etc. "Now let us make the fantastic assumption that Rome in not a place where people live, but a psychical entity with a similarly long, rich past, in which nothing that ever took shape has passed away, and in which all previous phases of development exist beside the most recent. For Rome this would mean that on the Palatine hill the imperial palaces and the Septizonium of Septimus Severus still rose to their original height, that the castle of San Angelo still bore on its battlements the fine statues that adorned it until the Gothic siege. Moreover, the temple of Jupiter Capitolinus wuld once more stand on the site of the Palazzo Caffarelli, withought there being any need to dismantle the latter structure, and indeed the temple would be seen not only in its later form, which is assumed during the imperial age, but also in its earliest, when it still had Etruscan elements and was decorated with terracotta antefixes. And where the Coliseo now stands we could admire the vanished Domus Aurea of Nero; on the Piazza of the Pantheon we should find not only the present Pantheon, bequeathed by Hadrian, but the original structure of M. Agrippa; indeed, occupying the same ground would be the church of Maria sopra Minerva and the ancient temple over which it is built. And the observer would perhaps need only to shift his gaze or his position in order to see the one or the other. It is clearly pointless to spin out this fantasy any further: the result would be unimaginable, indeed absurd. If we wish to represent a historical sequence in spatial terms, we can do so only by juxtaposition in space, for the same space cannot accommodate two different things. Our attempt to do otherwise seems like an idle game; its sole justification is to show how far we are from being able to illustrate the peculiarities of mental life by visual means."